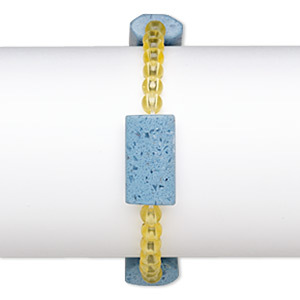 Bracelet, stretch, glass and acrylic, yellow and opaque blue, 5mm round and 24x14mm-25x16mm faceted puffed rectangle, 6-1/2 inches. Sold individually. Item Number: H20-E9878CL Have a question about this item? 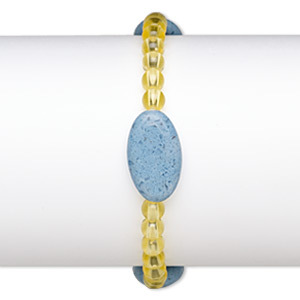 Bracelet, stretch, glass and acrylic, yellow and opaque blue, 5mm round and 23x13mm-23x14mm puffed oval, 7 inches. Sold individually. 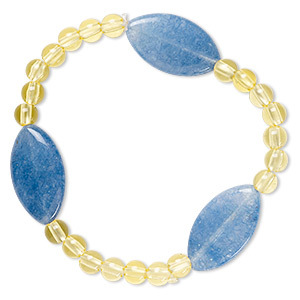 Bracelet, stretch, quartz (dyed) and acrylic, yellow and blue, 5mm round and 16mm puffed flat round, 7 inches. Sold individually. 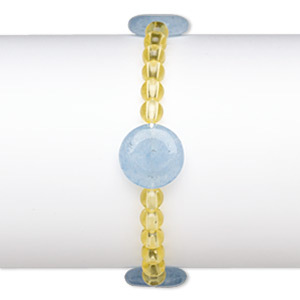 Bracelet, stretch, quartz (dyed) and acrylic, yellow and blue, 5mm round and 16x12mm-16x13mm puffed oval, 6-1/2 inches. Sold individually. 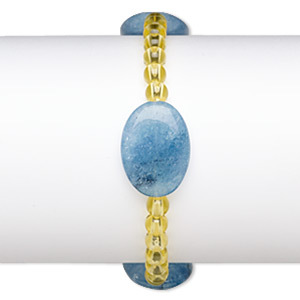 Bracelet, stretch, quartz (dyed) and acrylic, yellow and blue, 5mm round and 24x14mm-25x15mm puffed marquise, 6-1/2 inches. Sold individually. 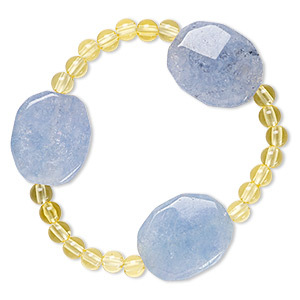 Bracelet, stretch, quartz (dyed) and acrylic, yellow and blue, 5mm round and 24x18mm-25x19mm puffed oval, 6-1/2 inches. Sold individually. 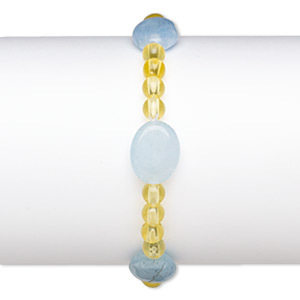 Bracelet, stretch, quartz (dyed) and acrylic, yellow and blue, 5mm round and medium to large faceted nugget, 7 inches. Sold individually. 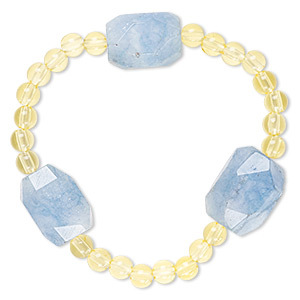 Bracelet, stretch, quartz (dyed) and acrylic, yellow and blue, 5mm round and 20x15mm-21x15mm faceted oval, 6 inches. Sold individually. 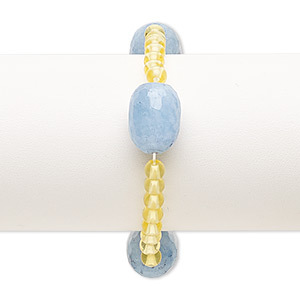 Bracelet, stretch, quartz (dyed) and acrylic, yellow and blue, 5mm round and 24x20mm-25x21mm faceted puffed oval, 6-1/2 inches. Sold individually. 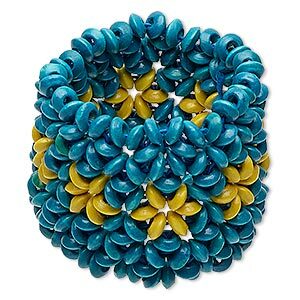 Bracelet, stretch, painted wood, blue and yellow, 51mm wide with flower design, 6-1/2 inches. Sold individually. 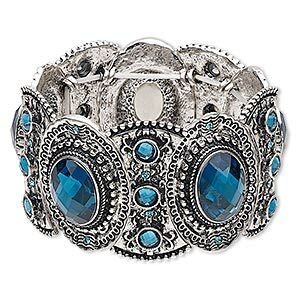 Bracelet, stretch, acrylic and antique silver-finished "pewter" (zinc-based alloy), blue, 38mm wide with oval design, 6 inches. Sold individually.